No spring flower display would be quite complete without the elegant tulip. From vibrant red cups to dazzling yellow and pretty pink petals, the tulip is an integral part of any spring garden. To get the best possible results follow these tips from the Royal Horticultural Society (RHS) and you will enjoy a spring show to be proud of. Whether used in formal or informal beds and borders, tulips make ideal bedding plants combined with annual or biennial planting. 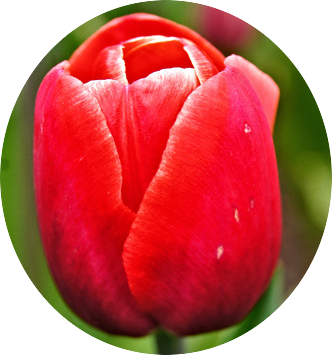 Tulips can also be useful for containers and some varieties can be naturalized in grass. Read on to discover all you need to know about these beautiful flowers. 1. Soil must be well-drained. Tulips grow best in fertile, well-drained soil in full sun, sheltered from strong winds and all varieties actively dislike excessively wet conditions. If your soil is more clay-based or too sandy try incorporating some organic matter into the soil to make it more suitable for tulips. 2. Plant from mid-to late autumn. This is later than most bulbs but a late planting can help reduce problems with the disease tulip fire (a fungal disease of tulips which produces brown spots and twisted, distorted leaves). Use only healthy bulbs, discarding any that show signs of damage or mould. Plant at least twice the bulb’s width apart and at a depth of two or three times the bulbs height. 3. Replace or dry. Most bedding-type tulips are best replaced each year. If left in the ground they are unlikely to re-flower after their first year. The alternative to discarding old bulbs and replacing with new is to lift and dry the tulip bulbs after flowering. 4. How to dry out your bulbs. Deadhead the tulip to prevent seed production and wait until foliage turns yellow before lifting the bulbs. Clean the soil off the bulbs and discard any that may be diseased or damaged. Allow the bulbs to dry thoroughly before storing. Store the bulbs in trays or net bags in a warm, dark well-ventilated place 18-20C (65-68F) before replanting in the autumn. 5. Varieties that re-flower. If you prefer not to lift and dry your tulips you could invest in some dwarf species tulips such as Tulipa kaufmanniana, T. fosteriana, T. greigii and their hybrids often re-flower without lifting. Only lift and divide when clumps get overcrowded. Although not usual, some cultivars growing in warm soils, where they can be baked in summer, may re-flower from year to year and possibly multiply. 6. Tulip types. If you thought one tulip was much like another, think again. Tulips are divided into 15 divisions, chiefly defined by their flower characteristics and sometimes referred to in bulb catalogues. Broadly speaking, their flowers can be described as single or double; cup-shaped, bowl-shaped or goblet-shaped; fringed, parrot or lily-flowered; long, slender-petalled or star-shaped. 7. Choosing your tulips. When choosing tulips, consider their flowering times, suitability for borders, containers or a rock garden where the smaller species such as Tulipa tarda AGM or T. kaufmanniana can be best utilised. Some are ideal for naturalising in fine grass, in particular the low-growing tulip T. sprengeri AGM.